Catherine W. Hopkins, 96, died on Feb. 8, 2019. She was a long time resident of the Peninsula and Lake Gaston, NC. Catherine is survived by one sister, Dorothy Harrah (Brent); two sons, Philip (Sandy) and John (Nikki); one daughter, Kathleen Spradlin (Bill), 10 grandchildren, and 9 great grandchildren. Born on Aug. 18, 1922 she was the daughter of Walter W. Walker and Pauline M. Hornong of Austin TX. Caye graduated from Hampton High School and continued her education at Cisco Junior College and Oklahoma A & M. She was an Air Force Inspector in Ft. Worth, TX during WWII. She was a teacher’s aide with the Special Education Department in Newport News Public Schools for 18 years. Caye was a member of St. John the Baptist Catholic Church in Roanoke Rapids, NC where she was a Eucharist minister and a lector. 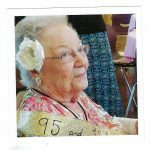 She was also an active member of the Lake Gaston Ladies Club and an avid Bridge player. Caye was preceded in death by her husband, Samuel J. (S J) Hopkins; her daughter, Mary (Becky) E. Ozkul; 4 brothers, and 2 sisters. A Celebration of Life will be held on Friday, February 15, 2019 at 11:00 AM The family will receive friends one hour prior to the service. Burial will follow in Greenlawn Memorial Park at 1:30 PM. In lieu of flowers donations may be made to St. John the Baptist Catholic Church in Roanoke Rapids, NC, St Joan of Arc Catholic Church in Yorktown, VA, or a charity of your choice.